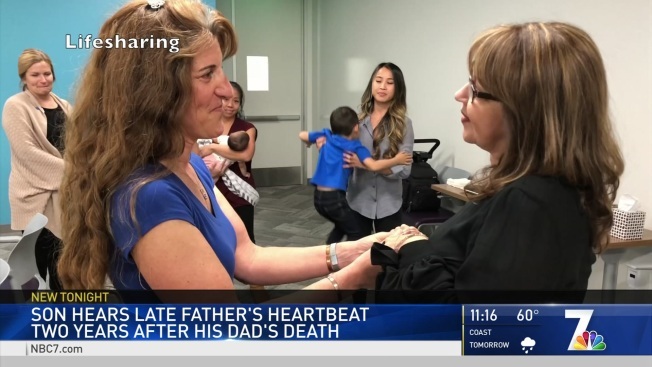 Two years after a South Bay father passed away, his mother and young son were able to listen to his heartbeat once again. David Rivera died from a rare blood clotting disorder in 2017 when he was just 30-years-old. On Monday, his family got to meet the woman who received his heart for the very first time. Rivera enjoyed teaching his son his love for the outdoors, and spending family time with his fiancée. “Everywhere he went, everything he did was about getting people together and making them feel special,” Rivera’s mother Susan Amador said. Amador was not at all surprised her son was at the heart of Monday’s special, hug-filled meeting. Sandra, the recipient of Rivera’s heart, says the gift saved her from years of trouble from heart disease that nearly took her life also. She placed the chest piece over her heart and gave the ear tips to Amador first. “It's strong. That's for sure. Very strong,” she said, listening to the heart that used to drum inside her son’s chest. Next it was Rivera’s son’s turn, 4-year-old Josiah. And when they tried to take the stethoscope away from him the toddler politely let them know he wasn’t done and wanted to listen for just a moment longer. And since Sandra can’t be with little Josiah all the time, she gifted him a teddy bear that plays a recording of his father's heartbeat so he can listen in whenever he wants. “He's going to come to realize his dad is a hero. That's very important,” Amador said. Amador says her family also received a letter from the patient who now lives with the lungs her son once used to breathe. Sandra and Rivera’s family live a mile apart and they say they plan to keep in touch.